Baked sweet potato fries that are caramelized and crispy on the outside and tender on the inside. No fryer needed here. Consider making a double batch, this one’s addictive. 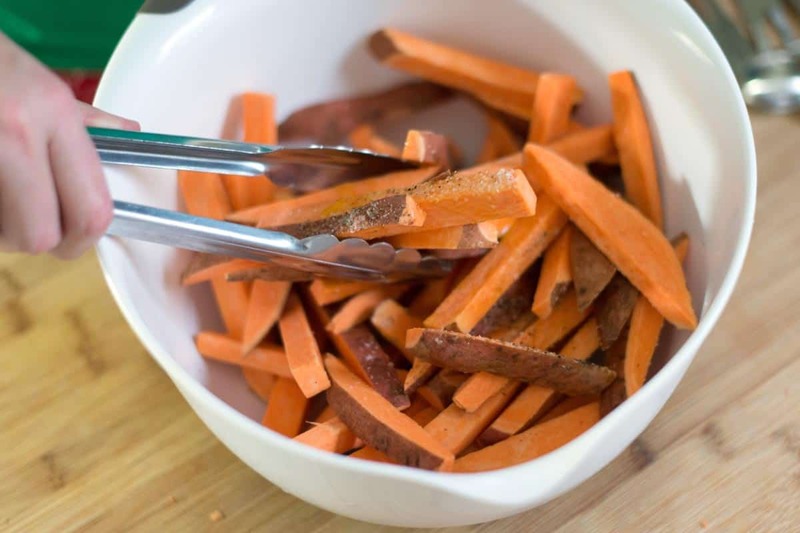 Jump to the Baked Sweet Potato Fries Recipe or watch our quick, straight-forward recipe video showing you how we make it. Over the last few months, we’ve been careful to take note of the meals we make most often. We’ve shared some with you already (our Roasted Pork Tenderloin Recipe With Apples is one of them). 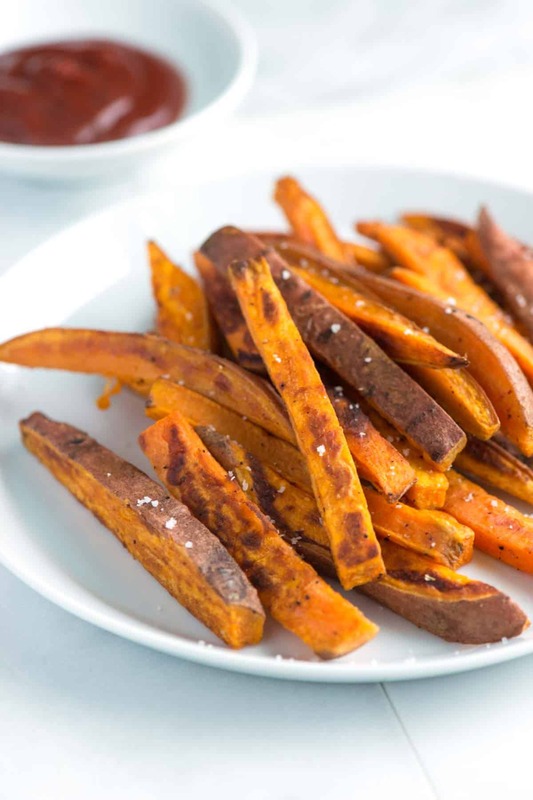 These simple sweet potato fries are another. We make them all the time. Sometimes as a side for dinner, but most often as a snack. We love that they are baked, making them much healthier than the fried options at restaurants. 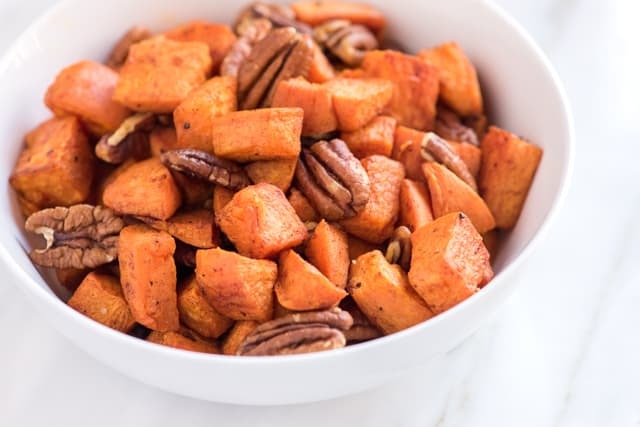 YOU MAY ALSO LIKE: These Coconut Oil Roasted Sweet Potatoes with maple syrup, cinnamon and toasted pecans. An easy, one-pan recipe. 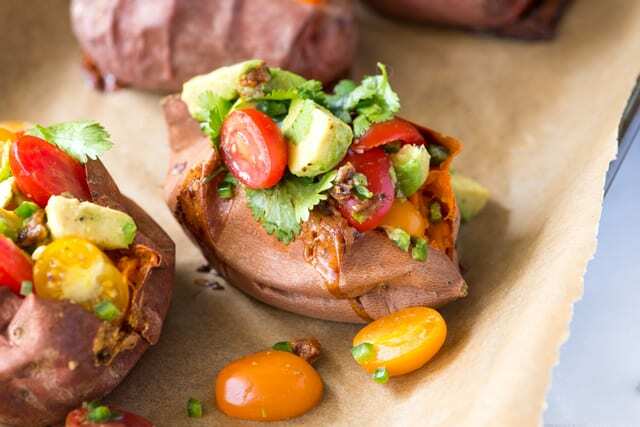 Or, take a look at these Baked Sweet Potatoes stuffed with roasted garlic, avocado and tomato salsa. If you love sweet potatoes, this recipe is for you! Let me show you how we make our homemade sweet potato fries recipe. 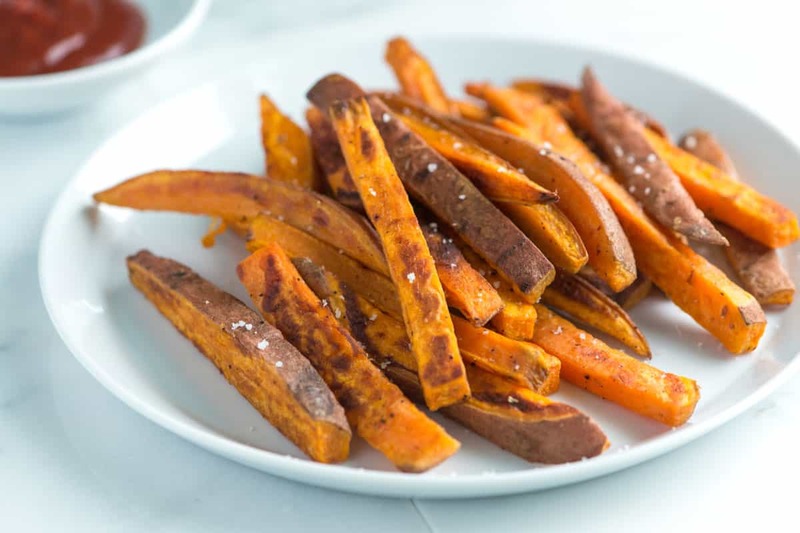 We toss thin sticks of sweet potato with olive oil, salt and pepper (you could also use coconut oil or lightly flavored oil). We keep them simple, but if you felt like it a pinch of cayenne, cumin or other seasoning would be a nice touch. Some even use cinnamon sugar. After tossing, we scatter the fries over two hot baking sheets — we use two so the fries aren’t too close to each other. If they were, they would steam instead of baking and crisping up. YOU MAY ALSO LIKE THIS: How to make our seriously good homemade ketchup recipe. 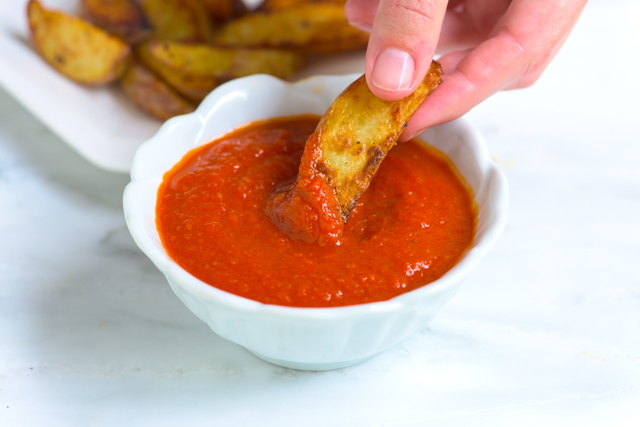 Make ketchup that’s better than anything you can buy at the store! Keep in mind that baking time may vary depending on how large you cut your sweet potatoes and how accurate your oven is. (Ovens often run a little cold or hot – ours runs 20 degrees cold so we keep an oven thermometer inside to keep it in check). We like to keep the skins on for sweet potato fries, but if you prefer them without, go ahead and peel them. Heat oven to 450 degrees F. Line two baking sheets with aluminum foil then slide into the oven so they become hot. Scrub then cut the sweet potatoes into 1/2-inch sticks. Add to a large bowl and toss with olive oil, salt, and pepper. Tumble sweet potatoes onto hot baking sheets and spread into one layer. Try not to crowd them too much or else they will not brown. Bake fries, turning once and rotating pans once, until edges are lightly browned and centers are tender; 15 to 25 minutes. The fries are done when the surface looks dry and the fries have puffed up a little. Don’t fret if the edges become brown, they will taste more caramelized than burnt. Serve fries with a sprinkle of extra salt on top. Cornstarch — Some swear by adding a generous pinch of cornstarch to the fries before tossing and baking to make the fries extra crispy. This does work so give it a try if you feel like it. We usually skip it, but that’s only because we’re very happy with the fries as-is. 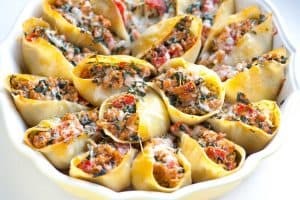 Thanks for all the recipes you’ve featured, they’re so helpful to me inspire me to cook. God bless you. What could you do if you don’t have aluminum foil? Baking them right on the baking sheet is fine or baking parchment paper works, too. A bit of work this one–sweet taters being thicker and harder to cut than regular ones, especially if all you have available are dull knives! The pans should be put on same rack so the fries bake at same time and temp- I had a few burned ones in pan on the the lower rack. Overall it was tasty and healthy alternative to the bagged frozen fries I left in the freezer for this meal. I made these, and I’m a good cook. This recipe did not work for me. Fries were tasteless and although not mushy, they were hardly crisp. Don’t bother. Hi Bud, Sorry they did not work well for you. Regarding the taste, we stick to simple salt and pepper for the recipe, but you can always add your favorite spice blend. To get them extra crisp, try the method using cornstarch we mention in the notes section. They turned out to be delicious! Everyone at home loved it! Temperature was far too hot. Burned black in 15 minutes. Won’t do that again!! It is possible your oven runs a little hot (many ovens do). Next time, try reducing the temperature by 25 degrees. Hopefully that helps! Hello, I’m a little confused, you say baking sheets but in the picture you have used foil, which one works better? Hi Frances, Sorry for the confusion. You can do either. The fries do get a little more browned and crispy without the foil. Then again, foil helps with clean-up. It’s totally up to you. I made these for dinner today. We had baked talapia and boiled cabbage with onion.Oh,so easy and so o o enjoyable! I also added a couple shakes of cummin and garlic powder to the ingredients. This will be my go to for french fries though they are roasted sweet potatoes.YUM!Thank You! Oh, no! Sometimes ovens can run too hot (ours does). You might want to consider buying an oven thermometer to check that what your oven says the temperature is matches the actual temperature. We have one in our oven and it has been so helpful! If you don’t want to invest in that, try reducing the temperature by 25 – 50 degrees next time and see if that helps. Yummy these are so good. do they have to be served immediately, or they can wait a while and reheated right before the meal? 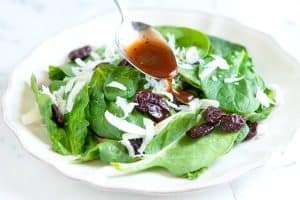 Used coconut oil instead of the olive oil and it turned out great, sweet and savory! I cook it for thirty minutes instead of twenty five, and they’re very crispy and delicious. Sounds great! Glad it worked well for you. I use to make this with regular potatoes and they were great. I am trying to lose weight, so I am wondering about the calories. Does someone know? It allows you to copy the ingredient list of our recipe and paste it into the form. Then it outputs nutritional facts. Hope that helps. 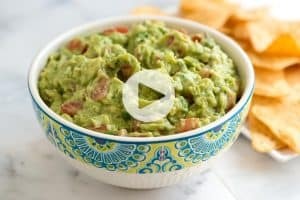 This is very similar to the recipe from Weight Watchers. If you are counting points, check out their website. Very FEW points. Scrumpdeli ishus! Making these for the second time! I throw some fresh garlic in as well! I love baking sweet potato fries! I love using cayenne and cinnamon together. I’m going to try the two-baking sheet trick next time. I must be steaming mine, because they don’t get very crispy. Thanks!! I just made something similar to this!!! I can not wait to try yours! 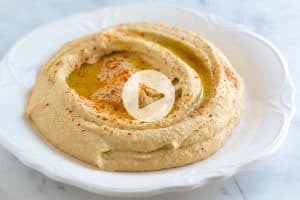 This recipe is so badly needed in my household. My husband and I are always trying to make baked SP fries, but we ALWAYS burn them. Well not always. When we don’t burn them, they’re mushy. haha. Thanks for this! 35 minutes or less?! I am in! Great side to lunch or dinner! I’m terrified of frying but love a good sweet potato fry! Will have to attempt this!